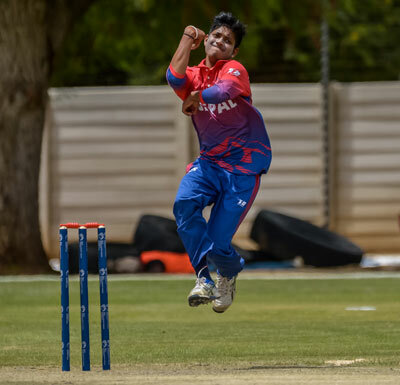 Division Two of the World Cricket League continued today in Windhoek, and whilst the hosts saw their match against Namibia fall victim to the weather, the other two matches were able to achieve a result, with Canada and Oman beating the UAE and Nepal respectively. At the Wanderers ground, UAE captain Rohan Mustafa won the toss and put the Canadians in to bat first. Captain Nitish Kumar provided the backbone to the Canadian innings with an innings of 62, whilst Dhanuka Pathirana chipped in with 36. Rohan Mustafa took 5-34 as Canada were bowled out for 209, four balls short of their 50 over quota. The UAE started their reply with an 88 run opening partnership, though Mustafa had retired hurt with the score on 21, the runs coming from Ashfaq Ahmed with 42 before he was the first man out and Ghulam Shabber, who scored 55 before he was the fifth man out with the score on 130. Ahmed's dismissal sparked a mini collapse as the UAE lost their first three wickets for just one run in six deliveries. Mustafa returned after Shabber's dismissal and batted for the rest of the innings to score an unbeaten 37. Adnan Mufti's 29 was the only other score in double figures though as the UAE were bowled out for 186, losing by 24 runs. Over at Affies Park, Nepal were batting first after Oman won the toss, and found themselves struggling with no batsman really able to get a decent start. The top score was Sharad Vesawkar's 22. Kaleemullah took 4-28 as Nepal were bowled out for just 138. Oman lost Swapnil Khadye early on in their reply, but otherwise had little trouble, chasing down their target in 35.1 overs to win by 6 wickets. Aqib Ilyas top scored with 46. Canada, Nepal, Oman and the UAE will all get a day off tomorrow before resuming on Sunday, whilst Kenya and Namibia will have to reattempt their game on tomorrow's reserve day.